This is the tastiest and easiest recipe I know how to do with fried eggs. This recipe is said to have originated from my village, Bleibel, in Lebanon. As my mother was new to this small village, she didn't know of this recipe until she married my father. Ever since I was a child, I loved 'beid breb' as we say it in Lebanese. 1. Put a little bit of corn or sunflower oil as a layer to cover the pan. 2. Heat the oil for a minute. 3. Carefully crack 2 eggs one at a time into the pan. 4. Let them heat for one minute or two. 5. Tilt the skillet and use a spoon to collect the oil and pour it over the egg white and over the yolk until the yolk is medium cooked. 6. 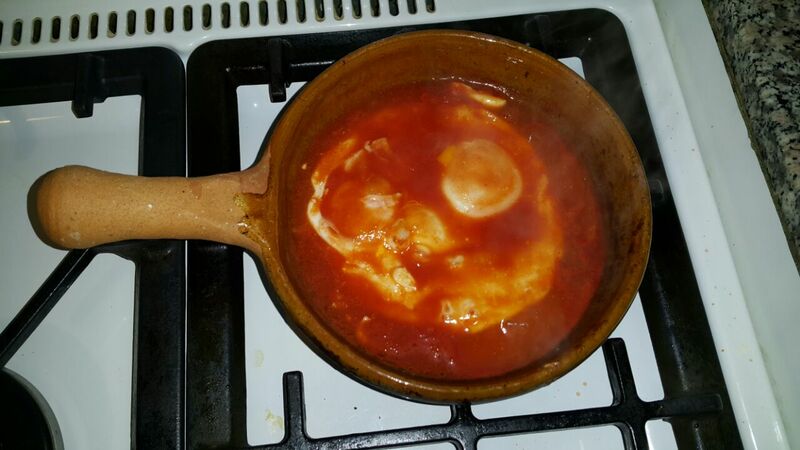 Pour some tomato juice over the eggs in the pan as much as you like. 7. Let them heat for one minute or two. I hope you enjoy it as much as I do. And remember it's from a special place called Bleibel!